Everton vs Manchester United, EPL 2018–19 Live Streaming Online: How to Get Premier League Match Live Telecast on TV & Free Football Score Updates in Indian Time? 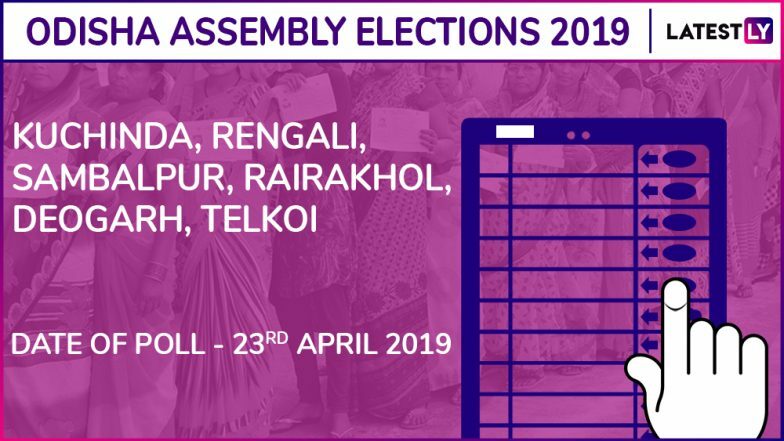 Kuchinda, Rengali, Sambalpur, Rairakhol, Deogarh and Telkoi are among the 147 constituencies being contested in the ongoing Odisha assembly elections 2019. These six constituencies will be contested in the third phase of the elections, to be held on April 23. Polling will be held in the above vidhan sabha seats between 7am in the morning to 5pm in the evening. Check Full Schedule of Odisha Assembly Elections 2019 Schedule. Results of 2014: In these 6 seats, the battle has been dominated by the Biju Janata Dal (BJD), whose four candidates had emerged victorious in the last assembly polls. Two seats were won by the Bharatiya Janata Party (BJP), whereas, the Congress drew a blank. Among these six constituencies, Sambalpur, Rairakhol and Deogarh fall under the general category, whereas, Kuchinda and Telkoi are reserved for scheduled tribes (ST) and Rengali for scheduled castes (SC). Voting for the Odisha assembly elections 2019 commenced on April 11, when the first phase of the contest was held. As per the scheduled prepared by the polling body, the state will elect its MLAs in four phases, ending on April 29. Results will be declared on May 23. In the last assembly elections, the government of Naveen Patnaik was re-elected to power, with the BJD winning 107 of the 147 vidhan sabha seats, whereas, the Congress and the BJP were restricted to 16 and 10 constituencies, respectively.